Carly and Bethany Bernatovicz train with JDRF Ride jerseys. 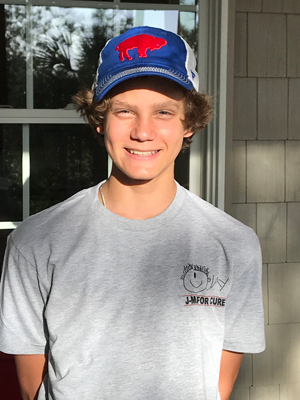 The Islanders will take part in a 100-mile bike ride to benefit JDRF and its mission to support those with Type 1 diabetes like their cousin and nephew, Jay Kuehmeier, below. Families often rally around their loved ones, and two Grand Island residents are no exception. Grand Islanders Bethany and Carly (Joslyn) Bernatovicz will participate in a diabetes charitable bike ride next weekend for their nephew and cousin, respectively, Jay Kuehmeier. 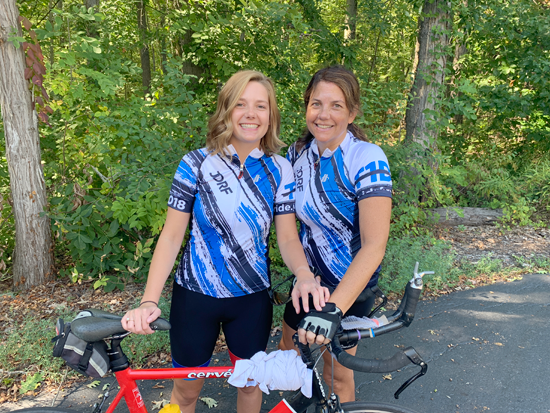 Inspired by Jay’s commitment to tackle the physical and mental challenges in living with Type 1, they have challenged themselves to a 100-mile bike ride to benefit JDRF, an organization committed to making Type 1 type none. Jay Kuehmeier was diagnosed with Type 1 diabetes at the age of 2 at Buffalo’s Children’s Hospital. At 15 years of age, he does not remember life without needles and blood sticks and doctor appointments. His parents were playing golf at River Oaks when someone mentioned to them that his symptoms sounded a lot like Type 1 diabetes. Unfamiliar with the disease, they looked online and he had all the typical signs: significant weight loss, extreme thirst and hunger, excessive urination, lethargy, erratic sleeping. They were lucky to get him to a hospital before the point of tragic consequences. Fast-forward 13 years, and Jay is an otherwise healthy, typical teenage boy. He loves to play goalie for his soccer team and go fishing with his dad, and he is a smart, hardworking student in high school. When asked about his Type 1, he will likely shrug his shoulders and not have much to say, which is what you’ll find with many people in his shoes. Since Type 1 requires management around the clock, it has become the fabric of his life. Imagine trying to tell one of your organs how to act, 24 hours a day, every day for the rest of your life. That is what Jay and all Type 1s do with their pancreas – but to simplify a picture in a more obvious organ: “Breathe lungs, in and out, in and out, in and out. Work faster now because I’m going to sprint, slow down now its time to rest, breathe deeper so the doctor can hear you, etc.” It is literally an impossible task, but required for a Type 1 diabetic to stay alive. They monitor their blood sugar, administer insulin, and hope it works. This can literally happen a hundred times a day. Thanks to better and better technology that is available, Jay’s parents can help monitor his blood sugar levels from a distance. Texts, phone calls, and alarms are a regular way of life. These tools are raising the bar on the standard of care, and provide some safeguards, and will help keep Jay and others who have access to them healthier until there is a cure. Bernatovicz and her daughter want to ride for Jay, for you, for a cure and anyone affected by diabetes. Making a donation to JDRF Ride will make an impact on people like Jay because every dollar put toward research will lead to making Type One into Type None. Checks can be written out to JDRF/Ride (MEMO line: Bethany Bernatovicz) and mailed to: the WNY JDRF office at: 331 Alberta Drive, Suite 106, Amherst, NY 14226.